Thanks for posting, Phruby and Ennis, and for bearing with me on my obscure & esoteric source material! Ennis, I agree, it is nice to take a break from SW from time to time. Besides, it's a fun challenge to try to use SW fodder to make completely non-SW characters! It always surprises me how much potential there is in that direction. Phruby, I'd be glad to make The Doctor if I'd ever seen any Dr. Who! I've been meaning to, bt haven't had much time. Could you or anyone else perhaps shoot a few reference pictures my way? Here's the premise behind the Jeeves and Wooster stories, in case anyone is wondering. They're not sci-fi at all, but they are completely escapist in their own way. Bertie Wooster is an independently wealthy young dandy, very good natured & has lots of friends, but not very smart. He's always getting into sticky situations (being engaged to the wrong girl, having any number of silly tasks to perform for his aunts or friends), and every time his rear is saved by the intelligence and cunning of his valet, Jeeves. P.G. Wodehouse wrote the stories between the 1900s and the 1970s, but they all take place in the Jazz Age, and Bertie is perpetually about 28 years old. They're just about the funniest things written in English, & highly recommend them to all! He is very simular to your current customs. That is Rose (his assistant) behind him. Rose....Aaaaarrr. Sorry Homer Simpson moment there. 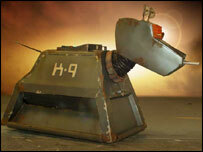 Here is his dog K-9. Maybe you can make a Cyberman (bad guys) to go with them. Esther, I like the non-star wars customs. Its nice to see a change of pace. Like Phruby and Ennis I'm not familar with the source but they are very good looking figures! You did an excellent job blending the parts and I really like the inclusion of removable helmets. Updated Baron Fel looks great, I think you nailed it. Nice work! Soontir Fel version 2 is extremely nice. 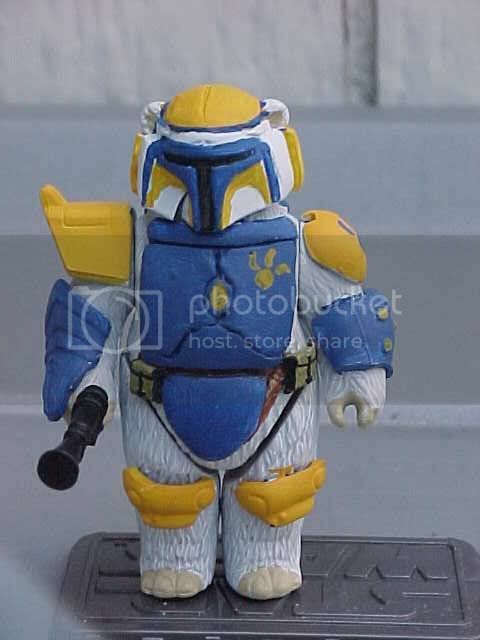 I love it when customs at this scale have removable helmets that look good...this one is just awesome. I agree its a tremendous improvement over the already very nice version 1. Can't wait to see your Dr. Who stuff! Thanks again to all for your comments, compliments, and good counsel! And now for an update. Today I invite you all to hop on over and take a look at my just-completed 12" Queen Apailana! She's made from one of the Portrait Edition Amidala dolls and sports a handmade outfit and headdress. I'm very proud of her, and I hope you enjoy her too! Wow! GORGEOUS, FW, simply gorgeous! Amazing work on the make-up and dress. This is really, really terrific. It looks completely professionally and completely beautiful. That is a beautiful custom. And I don't use the word beautiful very often. finds, that came out great! Your custom softgoods always look so amazing. I'd love to see a whole collection of Naboo Queens. She is simply gorgeous! These are the kinds of figures your best at. We haven't seen one of these in this scale for a long time. It definately was worth the wait. I love the headdress and the face makeup. Apailana is Beautiful Finds! Simply beautiful. The gown looks great. Show us the rest! this is the direction my customs will take in the future? Brent, oh gosh, there are so many queenly Naboo outfits I'd love to do. The victory gown and the Coruscant kimono, for example. But an entire series probaby won't be possible for a while! i know of others who have done this, though -- check out this link for some beautiful examples. And gosh, thanks for your kind words, Phruby, Quazar, and Chewie. I'm most honored! Actually that robotman wouldn't be hard to do. I see a lot of that SHS Iron man in that. Thanks a bunch, Ennis! (Should have said thaht earlier, I know.) I feel the same way about people who do things with molding and casting! More customs to come very soon, barring all catastrophe...! Sheltay Retrac, Bail Organa's aide. I enjoyed Johnboy Walton's version so much, I thought I'd make my own! Also, my Ysanne Isard, from the 12th Group Project, is now up, too. Do enjoy, everyone! Comments always welcome.